Mizuna Brassica rapa japonica, ‘Spider mustard’, ‘Japanese greens’, ‘Chinses lettuce’. Mizuna is a resilient and prodcutive salad green with a mild, lettuce-like flavour. It can be used raw as a perky addition to salads, sandwiches and pasta dishes as well as cooked in a soup or stir fry. 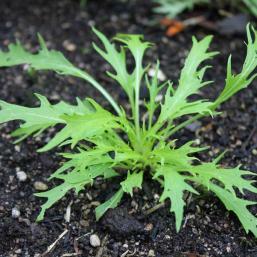 Fast growing and easy going Mizuna is a useful winter green as well as a summer salad. 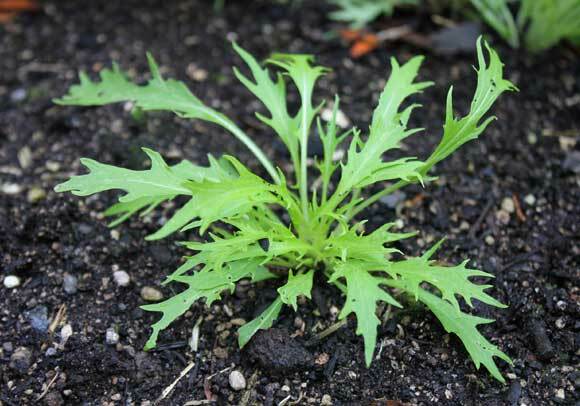 Mizuna is a decorative, low-maintenance super-tough green with saw-toothed leaves that sometimes see it used as an edging to flower beds. It grows well in containers too – particularly handy for winter crops in cooler and wetter areas where garden beds can become unworkable. All it takes is a few moments’ application now and in about 2 to 5 weeks you could be sampling garden fresh Mizuna in your kitchen. A single plant of Mizuna can provide you with a steady and sustainable harvest of lush leaves for several months if you pick leaves regularly. Companions Carrot, celery, onion, lettuce. Quantity 6 plants per person. Click through to view Mizuna seed options. Mizuna reliable and vigorous-growing, straight and green. Red Coral an open pollinated mizuna with finely serrated, dark maroon leaves. Good as a baby leaf or micro green. 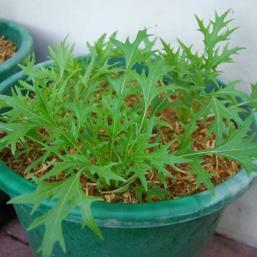 Mizuna can be sown all year round but grows best from autumn, through winter into late spring. 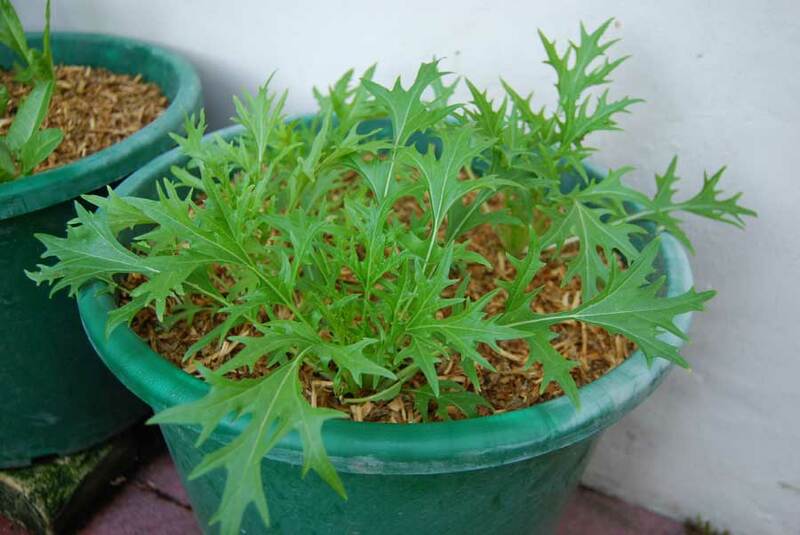 In warmer areas Mizuna can be grown outdoors all year round. In cooler areas its best to wait till early spring and then go again once the heat of high summer has cooled. The main point is not to sow it when there is that long-awaited temperature change between spring and summer as this will usually cause it to bolt and produce a flower stem - which causes leaves to go very bitter, although you can eat the bolting flower stems – sprouting broccoli style. 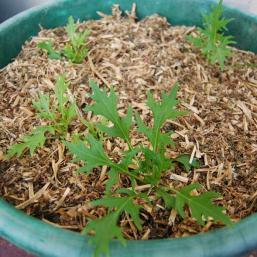 Mizuna is really a cool customer – preferring soil to be more moist than other greenery. It will however appreciate a little pampering in as open and sunny a position as you have available. It also grows well in beds between larger and slower growers such as sweet corn and runner beans. Alternatively sow in pots. Soil needs to be a touch moist so I make sure that there is plenty of well-rotted manure and compost dug in before I sow or plant. This organic material, as well as providing nutrients, will help to hold moisture in the soil and keep the fresh green leaves tasting sweet and mild. 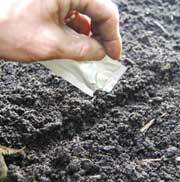 In warmer areas sow directly into the ground in rows or across a patch in your bed. Thin your seedlings as they appear. Alternatively, so in to trays and plant as seedlings if slugs are a problem – seedlings will stand a better chance of reaching amturity. If you are in a cooler area then sow under protection of fleece, plastic cloches or even better – in a greenhouse. When your seedlings have reached about a thumb’s length in height you can slowly move them out of protection so they get used to the colder temperatures of the open air and then plant as seedlings directly into your garden. 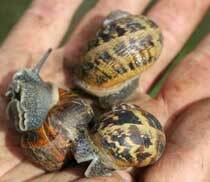 Keep an eye out for slug damage overnight. If you see evidence of attack then go on a slug hunt and utilize slug control methods. Maintain soil moisture and temperature. A mulching layer of pea straw, barley straw, shredded newspaper, dismantled cardboard box or even re-usable black plastic sheeting will help. Cut and come again – this means you cut all foliage down to an inch or so from the ground and then wait whilst the plant regenerates in the coming weeks before repeating. Plants need to be thinned to a spacing of about a finger’s length between each other. Young plants can be harvested when small to be added whole to recipes. Plants should be spaced about a full forefinger apart from one another in all directions. Grab a leaf and run – plants are grown for regular harvesting of young, outer leaves whilst the centre of the plant remains un-touched. Plants need to be spaced about two full finger-lengths apart from each other. 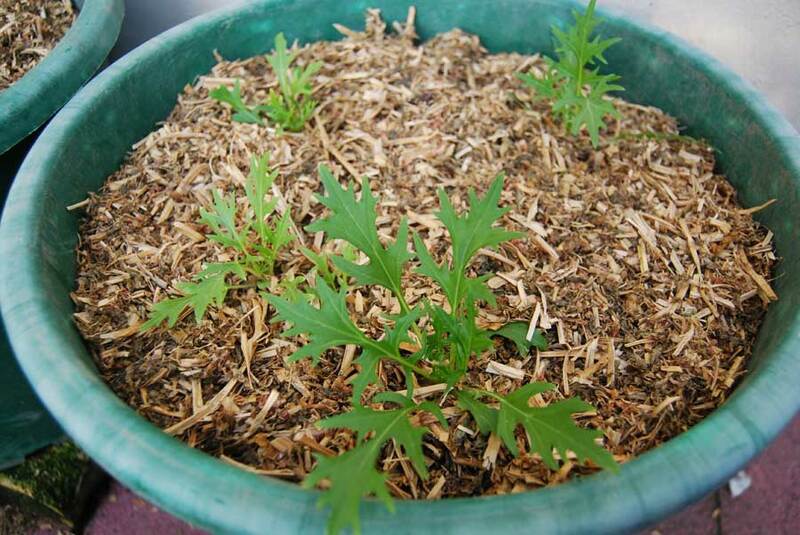 Mizuna that is grown to be harvested as an entire plant when fully in its prime will appreciate a bit more space. Give seedlings a spacing of around a hands’ length from each other. 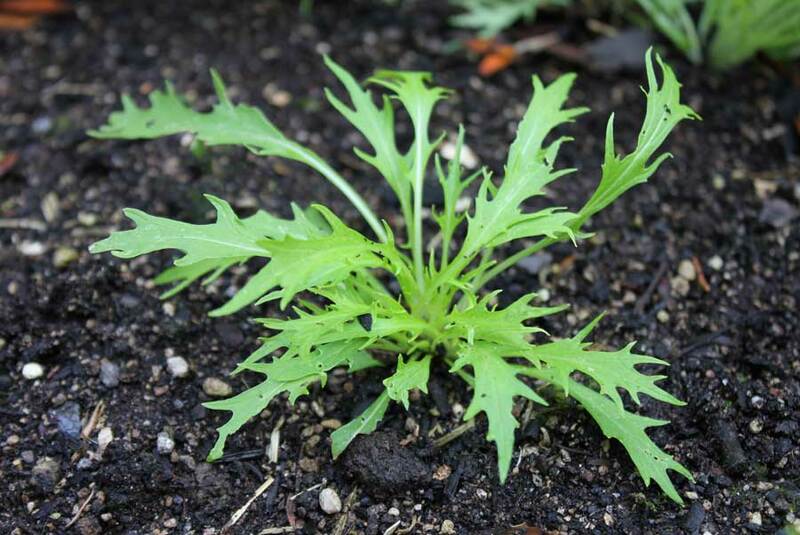 If you are majorly into Mizuna then you might try the slightly more peppery Mibuna. Remember that you can make successive sowings or plant your seedlings – say every three weeks – to prolong your harvest.